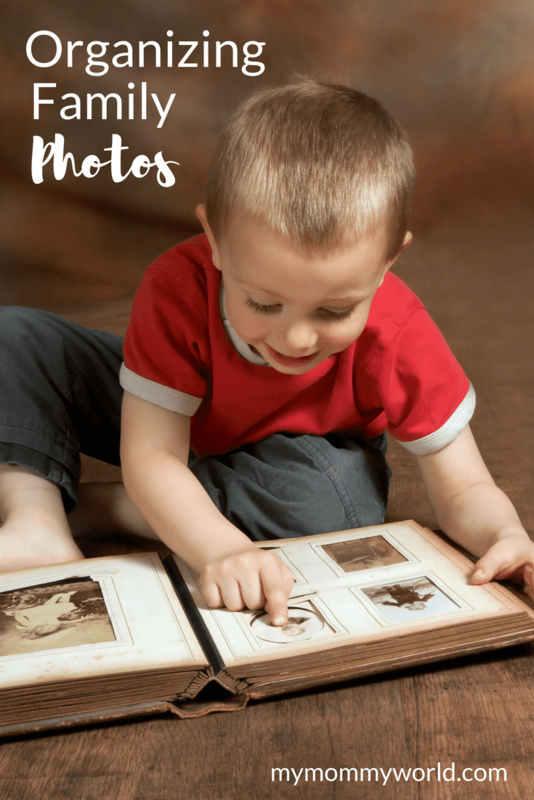 If you’re anything like me, you’ve been taking lots and lots of pictures of your kids since the day they were born…pictures of milestones, everyday happenings, and holiday celebrations and even family trips. That adds up to a lot of pictures to get organized! Organizing family photos can be a little time consuming, but totally worth it in the end, as you can look back on all the happy times you’ve had and remembering when your babies were actually babies! Shortly after my daughter was born, I became interested in this new thing called scrapbooking. Not only were there scrapbooking aisles in all the craft stores, but there were entire stores dedicated to this fun hobby! I loved creating pretty layouts in which to display my baby girl’s antics. 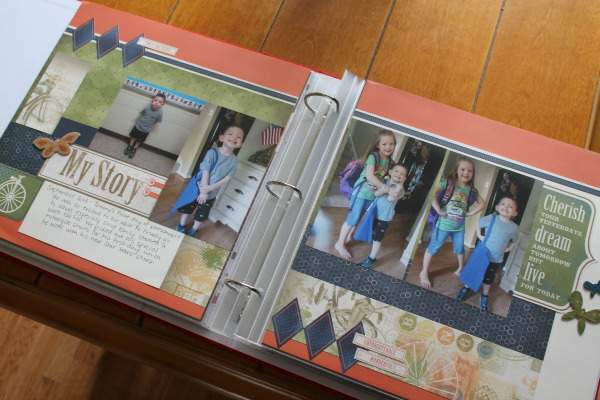 I scrapbooked almost everyday when she was little…during naptime…and went to crops where you could complete several different pages in only a couple of hours. Needless to say, I filled up a lot of albums. Then our son came along, and my scrapbooking time became limited, but I was determined that our baby boy should have at least as many albums as his sister had! I joined a crop club and got about 6-8 pages done at our meeting every other month. It was so much fun! When I started blogging, the free time I had during naps in the afternoon was taken up with work on posts, and I practically stopped scrapbooking altogether. Early readers of My Mommy World might remember that I used to showcase a layout every Sunday (Scrappy Sunday, I called it), until I got so busy with posts that I had no time to make new layouts. I hadn’t scrapbooked the last 3 years of my kids’ lives. And all the layouts that I had made at crop club were piled up under all that mess with no pictures on them. 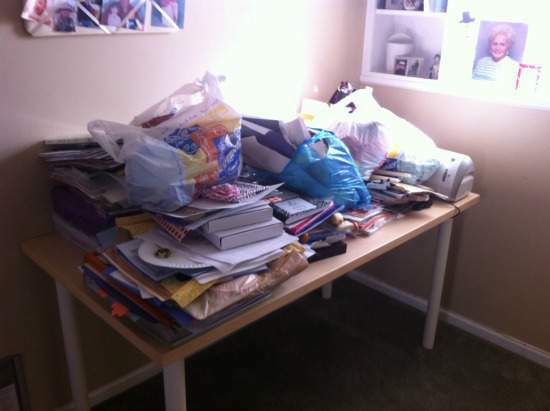 I knew that I had to get the whole big pile decluttered and start organizing family photos! The first thing I needed to do was to make paper copies of all the photos I had taken in the past 3 years. I know many people prefer digital, but I like having an actual album that I can flip through to see my memories. I like ordering my prints from Shutterfly because they run coupon codes for free prints from time to time, they provide good quality prints, and they ship directly to my house. Luckily, my prints came with the dates printed on the back, which was so helpful for organizing them, because it got to the point where I couldn’t tell one year’s trip to the pumpkin patch from any other. My method for organizing photos is a little different from most people: I scrapbook big events or milestones, such as birthdays or the Halloween Parade at school, and then place the rest of the prints into a photo album. The reasoning behind this is simple: not every single photo can be scrapbooked. I end up with so many wonderful photos that I just can’t fit onto a layout, but that I want to keep, so I put them into a separate album. My favorite scrapbooking albums are from the Paper Studio Line at Hobby Lobby. They are big 3-ring binders with canvas covers and you can fit a lot of layouts into them! They are often offered at 50% off, which is a great price for an album. I usually buy one album and one set of plastic cover inserts at a time. I usually buy my photo albums at Home Goods…they have these wonderful albums which fit 5 photos to one page…2 vertical and 3 horizontal. Because I tend to over-photograph everything to get the best shots for scrapbooks, I tend to have a variety of vertical and horizontal photos, and I like that these albums allow me to display all my photos. With all the photos organized in albums, it’s easy to pull them out every now and then and look at all our memories. Over the past few months, I’ve been going through all the photos I ordered to scrapbook them. Fortunately, I have a big stash of already finished layouts that just needed photos put on them. I also found this pretty Susan Branch Four Seasons Deluxe Scrapbooking Kit (affiliate link), which makes scrapbooking a breeze! All you have to do is trim your pictures to fit the boxes, then decorate with the included embellishments. I’ve made quite a bit of progress over the past few months…all the photos up to June of last year are scrapbooked, and filed away in an album. This stack of papers has been sitting on my kitchen counter for a few weeks to remind me to work on the layouts when I have free time and I’m hoping that I can get them done very soon. Hopefully, with the help of this post, you can start organizing family photos as you go along, so that you’ll save much time and frustration! Well done! I used to scrapbook with all my Creative Memories supplies but have now transitioned to digital albums. I use Shutterfly and love that they are saved forever – in case something happens, or if I want to print another one down the road. I’m trying to stay up to date but my son has just turned one and I’m already behind! Blogging does take up scrapbooking time. I need to make it a priority! Hey Kristen…thanks so much for stopping by! Creative Memories is so much fun, isn’t it? I have used their kits a few times, as well as the kits from Close to My Heart. We used to have a great scrapbooking store nearby, but the owner wanted to retire, so it closed…they always had such great ideas for layouts, and I’m so sad they are gone. Thank you for this inspiration, Erin. 🙂 I need to order a lot more of our currently-only-digital photos. I want to put together more photo books that we can flip through, too. I really need to organize my photos. Most of them are in storage on-line but it would be nice to have photo books to see. One thing I forgot to mention in my post are the photo books that you can get from Shutterfly, which make doing an album so easy! I make them for the grandparents once in a while so that they can have a nice book of photos of the kids. Good luck with your photo organizing! Oh, I really like the album with 5 photos to a page. I’m going to have to see about getting one for each of the kids. I was so behind in my scrapbooking too. But since I’m not good about taking photos, which I know is really bad, I not falling behind as much. I realized that I forgot to get out the camera and take photos at the birthday party we had last month. I did remember Christmas though. I’m trying to get better at taking everyday photos to put in albums. I need to just remember to grab the camera more often. I did the same thing at Christmas…I took pictures of the tree and the notes the kids left for Santa on Christmas Eve, and then I totally forgot to take any pictures on Christmas Day!